Matthew Barrett is the editor of the “5 Solas Series.” He writes this one on Sola Scriptura (Scripture alone). The others are on grace, faith, Christ, and glory to God alone. Barrett traces the Scriptures as our only final (and therefore inerrant) authority to the Reformation and then brings that doctrine home for today. Of the almost 400 pages in the book, the reader would do well in reading the first 150 pages. There Barrett walks the reader through the Reformation, to Modernism, to Postmodernism. He shows that we are again at a crisis of authority. Whereas the crisis in the 1500s was whether the Church and Pope were equal authorities (which Luther stood bravely against), to Modernism when science was exalted above Scripture, to today where individual opinion is supreme above all other authorities. The rule of any law, but especially God’s law, must not trump the individual’s “right” to do whatever he/she wishes. 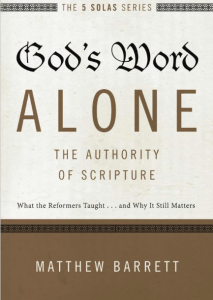 Barrett continues the book to establish that God still speaks with ultimate authority, in inspiration, inerrancy and sufficiency of Scripture, whether the current culture accepts it or not. A much needed book today.